The Working with Westerners Learning Path is specifically designed for global employees to understand the values, assumptions, and expectations that often underlie Western colleagues' work styles. 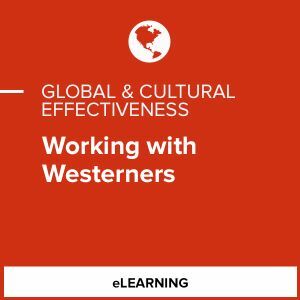 Identify cultural barriers that may be impacting collaboration and develop strategies for communicating effectively, taking initiative, raising issues, and resolving conflict when working with Western colleagues. This Learning Path is ideal for global employees of organizations headquartered in Western Europe or North America. In addition, global employees on assignment in Western Europe or North America will be better prepared to work in the new culture. This product is good for individuals working with North American or Western European counterparts.